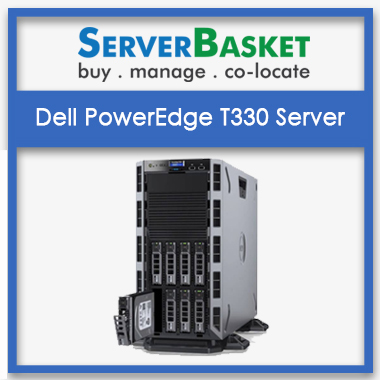 Buy Dell PowerEdge T330 server online, great Discounts, low Price Guaranty, Instant delivery in India, 3 Years seller Warranty, Less Than Any Dealer, Prater Price. Buy Now online, using any payment methods like EMI, Credit Card, debit card. 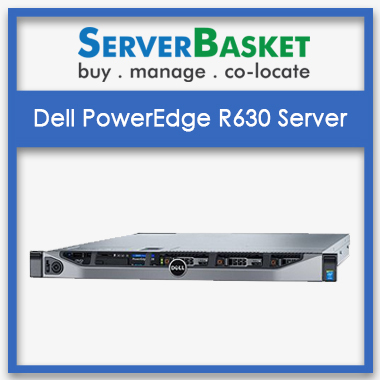 Dell PowerEdge T330 server comes with 64GB memory, 1 TB max storage at a cheap affordable price and avail instant shipping to anywhere in India. Over the years, it has served organizations with different types of high-performance servers suited for holding all types of business-critical applications. 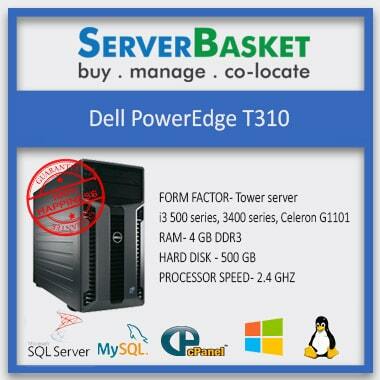 Dell T330 tower Server is a highly efficient server that suits perfectly for application storage. You can buy this server online here and avail best facilities like on site three-year seller warranty and fast Instant delivery. This Dell T330 Tower server consists of 1 socket server from the Intel Xeon E3 1200 V5, Intel Core and Intel Pentium i3 processor family. It is designed to meet all your business critical office /branch applications with a high performance, high memory and storage options. it is versatile, efficient and is ideal for expanding and growing data needs for the organizations. The Dell Poweredge T330 tower server provides great scope for expanding its data storage capacities with the help of 8 3.5 inch hard disk drives. You can gain a scalability level of upto 64 GB memory storage potential. 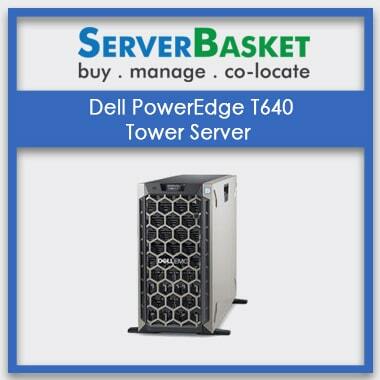 This Dell Poweredge T330 server supports over 4 memory sockets with scope for memory capacity of upto 64 GB. It consists of 4 DIMM slots, with DDR4 memory that drives data 4 times faster than its predecessor, DDR3. With every growth in your data requirements, there is scope for you to grow memory capacity, thus providing high memory performance and expandability. 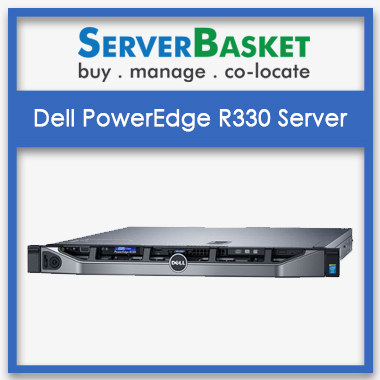 This Dell Poweredge T330 server consists of 8 3.5 inch hot plug Hard Disk drives or bays that drive your server performance considerably and expand storage capabilities. It helps you drive IOPS performance by two times with the PER C9 RAID Controller compare to the PERC8 RAID Controller from Power Edge. It also consists of 3.5 inch SATA HDDs and 3.5 inch SAS and Nearline HDDs.
. Our pricing is updated constantly to ensure that you get the best low price available online or at your destination. 100% guaranteed! What's more, we are committed to show you the 'cheap honest price' on our website never leading than our competitors. Buy the server online from us and get assurance that you will get Instant Shipping at your provided address on the scheduled delivery date without any restrictions. We deliver products within 3 working days to all the metropolitan cities like Hyderabad, Bangalore, Pune, Delhi, kolkatta and mumbai cities all over India without fail. Processor scalable - 1 x Intel® Xeon® processor E3-1200 v6 product family, Storage 8 x 3.5" SATA HDD (7.2K) / SATA SSD Hot Plug Drive Open Bay, 4 PCIe slots, 2 x 1GbE Network controller, Single Dell 350W AC, 240VDC Power Module, 24x7 Support. This seller provided me Quick delivery after placing an order. Am very satisfied with this seller. I purchased this server and tried to change server processor to Intel 7 I contacted help desk they solved my problem. Happy with the service. I purchased this server last week. I don’t know what type of drivers need to be installed. I called them for the support they resolved my problem. Servers are blazing fast, with a great connection. I have players from around the globe connecting to my server, with little to no lag. Every time I have used customer service, I have gotten a prompt reply within the next 24 hours, always with useful information, and always w in a respectful manner. I have not been able to install windows server 2008R2 on Dell PowerEdge T330.I am not able to install the drivers which I downloaded from driver download website.Please help! I had the same issue for windows server 2008R2 and I went through the installation guide and found the answer.Just use CTR-R in the start up and initiate the RAID which is created.It takes time and depends on HDD size. Dell R330 is a 5u tower server. Which type of proccesors are used in T330 server? 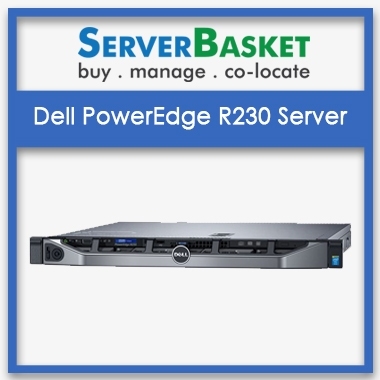 Does Dell Poweredge T330 server support for Linux Operating System? It does not support Linux operating system. How much memory does Poweredge T330 server required? Up to how much storage does this Dell T330 server capable? Which series chipset does T330 Dell server consist of? Chipset of Dell T330 server is Intel C236. 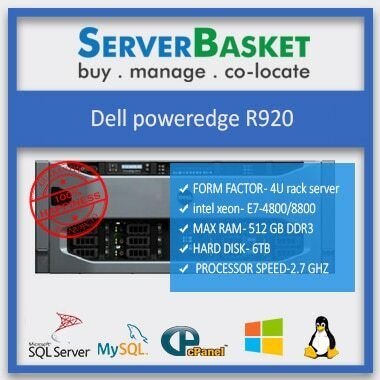 Which RAID configuration level is recommended for Poweredge T330 server? RAID configuration recommended for Dell T330 server is PERC S130, PERC H330, PERC H730, PERC H830. Which network controller does T330 dell poweredge server manage? Network controller managed by the T330 server is Broadcom® 5720. For How many years does this warranty provided for Poweredge dell T330 server? Dell T330 server provides 3 years onsight warranty. How much power does Dell T330 Poweredge server requires? Dell T330 server require 1 x 350W cabled PSU or up to 2 x 495W redundant PSUs.